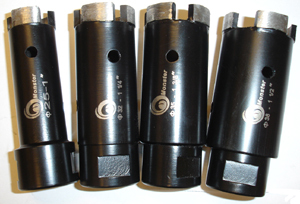 The set of core bits include one of each for the following Monster DRY/WET diamond core bits for granite: 1", 1-1/4", 1-3/8" and 1-1/2". Total sale price for the package is $146.50. Buy this set for $132 and save about 10%.